The island of Agistri is the ideal destination for a weekend or some days and for those who want to taste natural beauty in abundance. Its proximity from Athens make visitors an easy pole of attraction while the sandy beaches, the clear blue waters, the Greek traditional food, the romantic evenings and the sporting activities are all available on this small island. Agistri is also ideal for family holidays, with its gently shelving sandy beaches and inviting environment. The island is often described as the best kept secret of the Saronic Gulf and only 8 minutes away from neighbouring island, Aegina. It is also worth visiting the various archaeological findings at the Cultural Centre of Megalochori and the Greek Orthodox Churches. So welcome to Agistri Island! It's the perfect place to relax and have fun in a weekend. 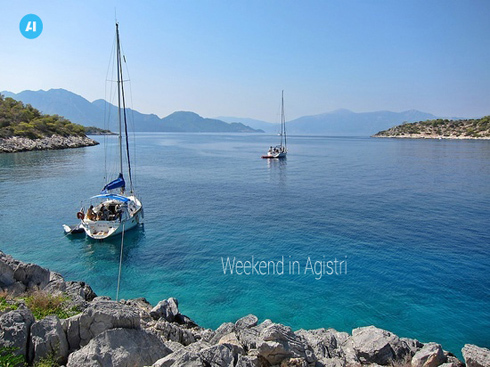 Here are some tips for a weekend in Agistri Island!